While having delicious Japanese food in some hidden bar-like restaurant in Melbourne with my colleague Howard Penny (wonderful guy, professor at ANAM and member of the Chamber Orchestra of Europe), my cellphone rang in the middle of dinner. This fact alone is worth mentioning because my phone very rarely rings, and if, it would be either my fiancÃ©e Geri or my son JÃ¡nos on the other line – other correspondence I take care of via e-mail. Normally I would ignore a phonecall being in company and especially while eating (not that I am so polite, but I just love food too much to be interrupted), but when I saw that the caller was our pediatrician Dr. Hauber I chose to answer his call, worrying about my son’s health. As Dr.Hauber is not only a doctor but also a collector of string instruments, which he loansÂ students more or less for free, as well as a benefit-concert organizer, this call luckily had nothing to do with JÃ¡nos but the unusual request of forwarding my cellphone number to the office of the German presidentÂ who was looking for a cellist to play at a state dinner honoring the Turkish president. Why him? Well, some doctors have good connections 🙂A few minutes later I was called by the president’s office in form of a very nice man who invited me for a nominal fee to perform two pieces of five minutes the day after my arrival from my five-week Australian tour. Since I don’t suffer jet-lag much I agreed to do it under such rather strenuous circumstances, also, as the gentleman pointed out, for the pure honor to play for the president. Further details we fixed later in some e-mails, especially the repertoire (Prelude o f the Sixth Bachsuite and the last movement of Mozart’s G major duo for violin and viola, arranged for cello, with Geri, who by the way is an amazing violinist). Geri and me worked the Mozart Duo with great detail and dedication the morning after my arrival (I had an early start anyway, as my son Janos had to be prepared for school), and after a couple of hours of desk work (tons of mail after 5 weeks “off”) we drove to “Schloss Bellevue”, the residence of the German president in Berlin. We arrived there shortly before 7 pm, hundreds of soldiers already awaiting the Turkish president with torches in front of the castle while we made our way through the back entrance. Unfortunately there had been a bomb threat that afternoon which delayed the whole evening for about two hours. When guests were getting a bit nervous, I was called from our dressing room to play already something ad hoc. Trying to be a good sport I sat down in the big dining hall and started playing the first Bachsuite – with absolutely no effect; people didn’t even seem to notice me at all. It felt rather humiliating and very embarrassing, and I am still upset with myself that I didn’t behave more “divaesque” and stopped playing after the first movement. But maybe I believed so much in the power of Bach’s music that I wanted to give them a chance to settle and come down – no chance! They continued chatting, laughing, moving around, though I played until the end and left, unnoticed. To my horror, when it came to my official first “set”, the Prelude of the sixth Suite, all printed in the evening program, with biography and everything, the attention was equally non-existing; nobody bothered to listen, and again I left with no applause, maybe the way how musicians used to be received three hundred years ago. I was promised that for the Mozart Duo it would be better (played before the dessert was served), to no effect; even the beauty of my fiancÃ©e could not change this disastrous reception of the political and economical elite of Germany and Turkey. Our president I never met that evening, which was only for the better, because I was so angry, I might not have been on my best behavior; I just saw all to clearly the sad irony, that the president of the country which prides itself so much of its culture, doesn’t mind waiting on an airport runway for some second-rate pop-starlet to leave her plane after returning from the Eurovision Song Contest, a highly embarrassing display of pop culture in Europe, while when hiring one of Germany’s more succesful cello soloists to his own place, he not only ignores him completely but also let’s him dine at the staff’s table. Oh no, I have no ego problem, I am not a diva at all (if I was I would not even have started playing under such circumstances), but this was not only disrespect to us as musicians, but much worse to Bach and Mozart. 20 years ago I had played for our former president Richard von WeizsÃ¤cker, a highly cultured man who went to concerts frequently in Berlin, and after the residence concert he tookÂ his time to talk to me about music, never mind my youth and utter unimportance. Now, twenty years later, same place, different president, what a disappointmentâ€¦ At least I had some healing experience by visting a few days later a school in Berlin-NeukÃ¶lln, a district with a high percentage of kids with migration background. Oh, these children listened so extremely well, you could see the surprise in their faces when hearing for their first time a suite by J.S. Bach, never mind what their cultural background was. Their questions were well thought of and the 90 minutes of play and talk went by like nothing. And these are the kids our politicians are worried of loosing? I have great respect for politicians, it’s a tough job, I wouldn’t want it; but one thing is for sure: these twelve year olds were by far better listeners than their own president and his high profile guests! Right now I am on my way back from Nottingham to Manchester after having played a Dvorak Concerto with Britain’s oldest orchestra, the marvelous HallÃ© Orchestra under AndrÃ© de Ridder. It wasn’t an easy performance, as they never are, these so-called “run outs”. We rehearsed yesterday afternoon in Manchester, drove today the two and a half hours to Nottingham, did a full dress rehearsal at 3:30 pm, then a quick dinner, pre-concert talk and performance at 7:30. I was facing a special handicap in form of my cello, or rather its new bridge. Already in Sydney my bridge was too low, and I had one not so great one made there (too thick, and also too low, what a waste of money! ), so after I got back to Berlin I handed my cello over to my luthier who made a specially high bridge, just in case. What does it mean? Well, the bridge is the thing which holds the strings up, standing on the top of the cello between the two f-holes. If it’s too low, the strings will hit the fingerboard and start buzzing, as soon as we put too much pressure. 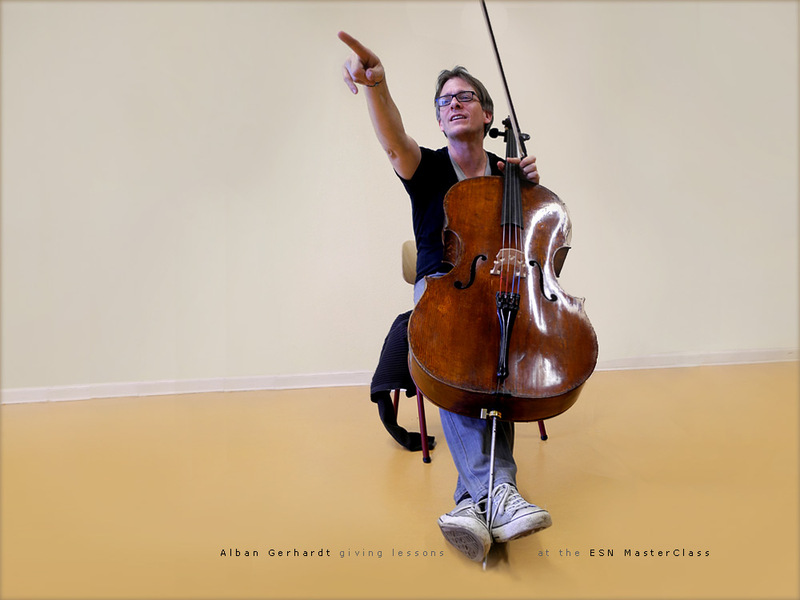 If it’s too high, we need much more energy and strength to push the strings down and the cello might sound too tight. Tomorrow I am off back to Germany, performing and teaching for the first time in my life at the prestigious Cello Festival in a city near Frankfurt called Kronberg. Interesting to play for people who care so much for the cello; critical audience but knowledgeable I guess – we’ll see. The masterclass is tomorrow, rather short, two hours I reckon, and on Sunday I play Shostakovich’s First Concerto again, with the Kremerata Baltica – always fun to do that piece with a chamber orchestra, as they tend to be the most flexible and exciting. The Bellevue part of the story made me so sad and so mad. It is doubly shocking to have this happened in Berlin…in Germany. What were the managers thinking when they contacted you for the performance? Still audiences in Berlin are special. I still remember about 10 years ago when Abbado returned from his sick leave to conduct Parsifal at the Philharmonie. I attended every single concert of that series and I was astonished by the concentration of the audiences. No audible cough or sonic disruption of any kind! Auf jedenfall freut mich zu hÃ¶ren dass es dir gut geht und offensichtlich bist wieder verlobt? Going back to one of your posts, about performers “emoting” during their play, something interesting happened this past week here in Boston. At the last minute, the pianist Nicholas Angelich was a late substitute for the injured Yefim Bronfman in Brahms’ 2nd piano concerto, conducted by Kurt Masur. I had never heard Angelich before live, just in recordings from Martha Argerich’s Lugano festival highlights. He was FANTASTIC. It was by far the best live performance of Brahms’ masterpiece I’ve ever heard (outperforming live performances I’ve heard of Peter Serkin, Emmanual Ax, Nelson Freire, Alfred Brendel, and a number of others). There was such sensitivity, modesty (while not being immodest), humanity, and beauty in his playing. It was extraordinary–totally not routine, by an artist who was thinking about nothing more than serving the music. Very rare indeed. I was transfixed throughout the performance, and at the end, I was only one of two people in the audience to leap up and applaud loudly. The rest of them sat in their seats and applauded, although SLOWLY, eventually many in the crowd did rise and applaud. Yet so many times in Boston, the audience is quick to jump to its feet and give standing ovations to very substandard concerto performances. The difference? The visual “performance” by the pianist. Nicholas Angelich instead just played the music. No weird, “pained” facial expressions, no visual flourishes, no swaying body movements, no emoting, he just sat there and played MAGNIFICENTLY. I had always thought that Boston audiences were more musically-alert than the average audience, but I guess not. It was very sad in a way that he was denied the thunderous ovation that Boston audiences are known to give to performers who “visually” perform (even if the musical performance is indistinguished). Sorry to hear about your bad experience in Bellevue. But first this president seems to be a mistake in german history (is he still alive – he rarely takes places in the public) and second a last minute call should show you that it can’t be as important while playing in backround. And my advice: You should better inform about the circumstances. it wasn’t a last minute call, and I knew that we were not supposed to play in the background. I received by now a letter of apology of the president (the German president has only representative duties, so he is not so well known in other countries – the big job in Germany is the chancellor) because they had never experienced something like it. But thanks for your advice anyway. My career doesn’t take place out of Germany, but I am German and live in Berlin, so I travel out of Germany. Most of my concerts I am playing in Europe, the US and recently also in Australia in Asia. It is a rather well-balanced career, but I am not as famous as other people because I have a bit different priorities (or maybe because I just stink :)). Alban, I remain a huge fan..and so amazed at your on-going work. I saw and had the pleasure of meeting you in person when you were in Portland about 5 years ago. I continue to follow your work as the best cellist in the world today (in my humble opinion.) You are a very modest and that is one of the things I appreciate most about you..is your ability to present “Alban” to the world…I just heard your premier of the Unsuk Chin Concerto on YouTube. 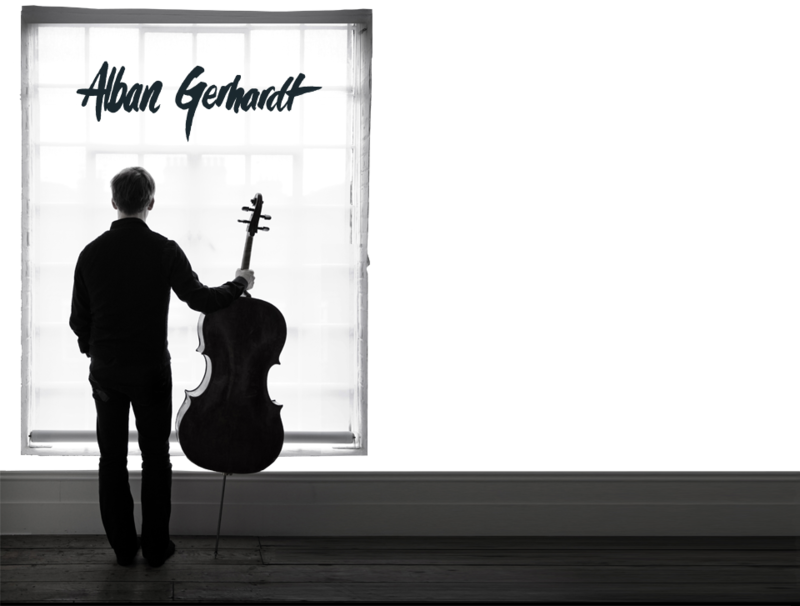 I consider myself to be a cellist that is not afraid to go to unusual places with the cello…but this concerto puts one in far away places that require only the greatest to journey to for only they can be there and represent what the composer has written. I am purchasing the Casals CD immediately..I enjoyed watching the video on the recording sessions…Recording is very challenging…and your statements about how movie actors will do take after take to get something right was very familiar. It is arduous work.